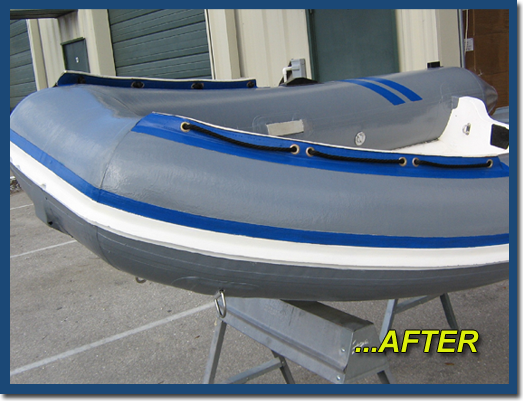 To repair & restore inflatable boats and related products. 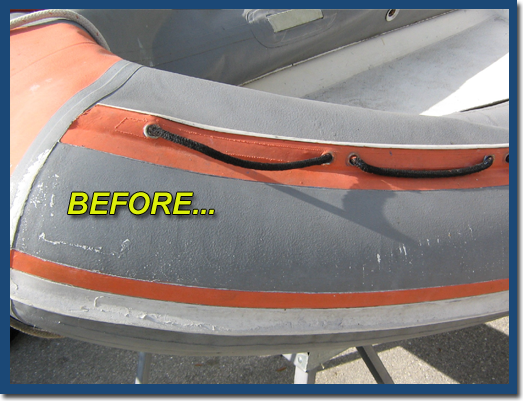 If your inflatable boat, kayak or dinghy is old and worn out, restore it with our complete restoration kits. Works on Hypalon and PVC fabric inflatable boats and other inflatable products.Restores up to a 10 foot inflatable boat (tubes only not including the inner or outer floor). Check out the restoration project pictures below. These have been used by the U.S. Navy Seals on their boats. Sealant... Stops slow pinhole and seam leaks from within. Liquid Rubber... Repair worn areas or re-skin the entire boat. 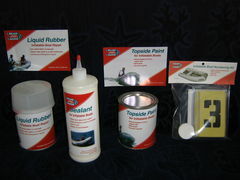 Topside Paint... Stays flexible and makes your boat look new. Stencil & Numbering Kit... Meets USCG requirements. Won't peel off. 1 quart tin of liquid rubber - Gray only. 1 quart tin of topside paint - Black, Gray, or White. 1 stencil kit (with stencil paint also). For more detailed information on each product in the kit, visit their respective pages linked above.